San Diego political, civic and religious leaders officially opened the Piazza della Famiglia, a new community center for downtown San Diego’s Little Italy neighborhood. 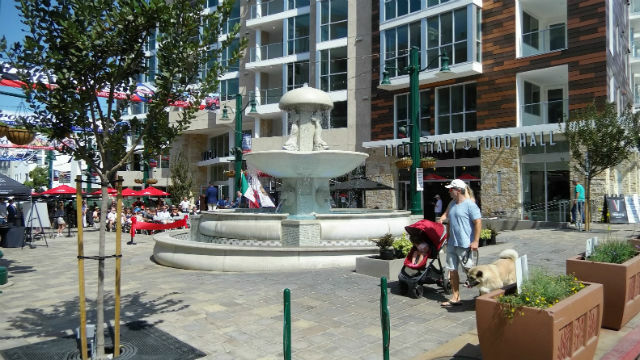 The 10,000-square-foot piazza replaces a one-block stretch of Date Street with a giant fountain and tables for outdoor eating and drinking. It’s designed to be reminiscent of traditional Italian public spaces and is positioned so that cooling breezes flow up from the bay. “This is a special place for San Diego…a city that is modern but embraces its historic roots,” said Mayor Kevin Faulconer. Falconer and others spoke about the multi-year effort to close the block and develop the piazza and surrounding mix of residential, retail and restaurant space, including 125 apartment homes and over 16,000 square feet of retail and restaurants on the ground level. “By closing a road, we’ve connected a community,” noted City Councilman Chris Ward, who represents the area. The dedication included a blessing and sprinkling of holy water by Father Joseph Tabigue of the iconic Our Lady of the Rosary church nearby. The piazza was developed by the H.G. Fenton Company, whose CEO Mike Neal described the project as a visionary improvement to Little Italy.